Canada’s Christine Sinclair accuses ref of deciding result before match after semifinal loss to U.S.
Canada captain and all-time leading scorer Christine Sinclair put in a masterful performance in her team's Olympic semifinal against the U.S. She scored a hat trick -- only the second hat trick ever scored against the U.S. women's team -- and three times gave her side a lead before the U.S. eventually won 4-3 with a last-gasp Alex Morgan header at the end of extra time. As difficult of a way to lose as that is, the normally mild-mannered Sinclair targeted the referee after the match for a combination of calls that helped the U.S. put the match at 3-3 late in the second half and push it to extra time. With Canada up 3-2, goalkeeper Erin McLeod was called for time wasting after it was decided that she held the ball longer than the six seconds allowed. It's a violation that is very rarely called and prompted Canada to react with anger and disbelief. But the U.S. was given an indirect free kick inside Canada's box as a result. On that free kick, Megan Rapinoe hit Canada defender Marie-Eve Nault, who was called for a handball, angering Canada even further. 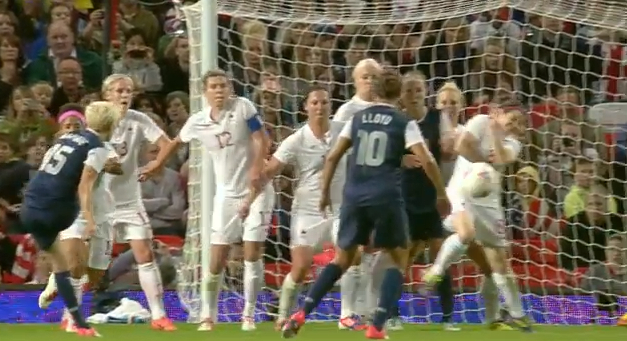 The U.S. was given a penalty and Abby Wambach converted it, scoring her fifth goal in as many matches. "Obviously, we're disappointed and upset. 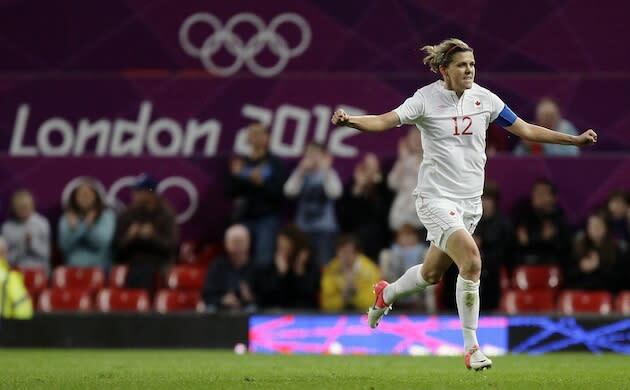 We felt that the referee took it away from us, so, yes, we are disappointed," Canada captain Sinclair said. "We feel like we didn't lose, we feel like it was taken from us. It's a shame in a game like that, which is so important, that the ref decided the result before the game started." Sinclair was furious over the awarding of the penalty. "She (the referee) actually giggled and said nothing. Classy. In an important match it's a disappointment that the referee had such an impact on it. We feel cheated," she said. Herdman says "it felt like it was America and the referee against" his team in the 4-3 extra-time defeat at the Old Trafford in Manchester. Herdman was upset with referee Christiana Pedersen of Norway for a decisive penalty awarded to the United States. He said he didn't think it was a hand ball and didn't understand why she awarded an indirect free kick against goalkeeper Erin McLeod for holding the ball inside the area for more than six seconds, a foul that led to the hand ball. Herdman said that if "the United States were honest they'd know they got lucky." It's a shame Canada, and Sinclair in particular, was left with such a bitter taste after putting in an extraordinary team performance. The suggestions of foul play were likely a byproduct of intense frustration and disappointment, but it seems highly unlikely that that was the case. As unusual as the call on McLeod was, it is a rule and officials are free to invoke it. If anything, the 31-year-old Pedersen might be guilty of inexperience for a match of this magnitude. Canada is unlikely to find that much more comforting though.